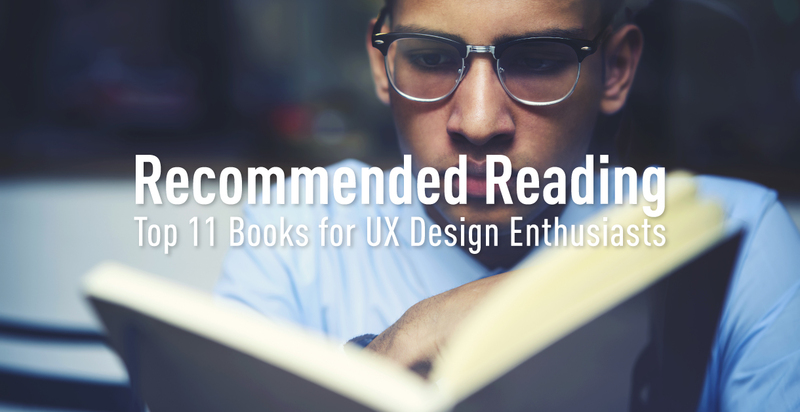 For all of you budding UX designers, or for those of you simply interested in finding out exactly what UX is, we’ve put together our list of the 11 very best books on UX design. Recommended by our in-house designers Dee and Jeff, and the founders of design agency AJ&Smart, these books not only explore design, but also success, innovation, and life. Watch the videos below to find out why they’ve chosen this line-up. To learn more about UX design principles and practices, head over to our website and check out the Certified UX Designer course syllabus. This book is very commonly found on designers’ bookshelves, and for good reason. It covers the fundamentals of what design is, why design is important, why some things just feel uncomfortable and others feel delightful to use. One of the great examples in the book is the ‘Norman door’ - that awkward moment of pulling a door instead of pushing it, which is usually the result of bad design. It’s an all-time classic that was originally published in 1982 and has since undergone many revisions to bring it up-to-date. One of the biggest themes explored in this go-to resource for usability is how people read on the web, and how they navigate sites. He draws some very interesting comparisons between this online behaviour and behavior in real-life. A key takeaway is that not everyone is the same and you have to design for different behaviors - like in real life. It’s a quick read and as the author Krug said, it’s designed to be read in one plane ride so no excuses! While it’s not strictly a design book, Daniel Kahneman explores in depth how quickfire vs considered decision-making determines how people behave in different situations. The book can help you reconsider your approach to user research and has insights on how to have better conversations. Some of the ideas in the book are also valuable to keep in mind when designing products. This book helps you to think about your role within a company, and company strategy. It explores the fact that key decision-making should happen through user research and testing, rather than sat around in a board meeting. While difficult to adopt for companies, this UX-led approach is becoming crucial in order to survive. Gothelf also explains how to do projects collaboratively, and focus on solving user problems rather than adding new features. It’s a chunky book, so we recommend taking notes! Another great book that focuses on psychology and human behavior, it helps you realize that having more choice doesn’t bring a feeling of freedom. In fact, having too many options can make us overwhelmed, doubtful, afraid of regret, and so on - something valuable to take into account when you’re designing. Though it’s from 1995, and it’s slightly more focused on designing interfaces, the examples are amazing, e.g. remember Windows 95? To some extent, being so dated makes the examples easier to understand, and many of the same principles still apply today. Its unique strength is showing side by side examples of good interface design versus bad interface design. This one’s simple to summarize - it’s a step-by-step guide to building awesome products really fast. With the motto “Change the way you work forever” this book offers amazing advice for running a business or running a team, but it can also be very effectively applied to building products. Written by the inventors of design thinking, Tom Kelley and David Kelley, this book encourages really trying to bring your customer on your journey with you. It explores the notion of building empathy your relationships with all ‘customers’, be it a user, a client, or your employer. This book summarizes some of the best tactics and routines from guests on Tim’s podcast. If you want little snippets of wisdom; new ways to approach work and life, then this book is perfect. It’s a great coffee table (or bathroom) read, but AJ&Smart founder Jonathan recommends treating like a normal book and powering through from cover to cover. “Most of us have two lives. The life we live, and the unlived life within us.” This quote from the first chapter gives a good insight into what this last book is about. It’s highly recommended if you’re struggling with motivation and procrastination!